01. When the Jahmiyyah (an umbrella term also incorporating the Mu'tazilah, Ash'ariyyah, Maturidiyyah) wrongly thought that proving Allaah's existence was the core foundation of the deen of Islaam - [and they did so using a corrupt, flawed proof which, when analyzed and taken through to it's actual logical outcome, proves the opposite, that there was no "act" of creation that took place] - they claimed the first obligation is to investigate and prove belief in a creator (al-nadhar wal-istidlaal). The claim of this being the first obligation is written textually by the heads of the Mu'tazilah such as al-Qaadee Abd al-Jabbaar, Ibrahim al-Nadhaam, al-Zamakhsharee, and the Asha'ris such as al-Baqillani, al-Baghdadi, al-Juwaynee, al-Aamidee, and likewise the Maturidis, Abu Mansur al-Maturidi, and Abu al-Mu'een al-Nasafi and others. As a result of this fundamental error (see Part 1), they also erred in understanding the reality of the Tawhid the Messengers were sent with, and hence in their definitions, they restricted the meaning of this Tawhid to be centred around the qualities and descriptions for the "cause" (behind the universe) they had identified through their kalam argument. This is what Ibrahim Osi Efa does next, where he lays the foundations for his audience through incorrect, deficient definitions of Tawhid that will corrupt their understanding and leave them vulnerable (over time) to falling into the greatest of that which Allaah forbade, setting up partners with Him in worship (shirk), thinking, through incorrect definitions, that they are not committing shirk. 02. The Ash'aris make mistakes in defining and understanding the terms (توحيد) "Tawhid", (إله) "ilah", (عبادة) "ibaadah" and they also restrict the matter of Tawhid to knowledge (ilm) and statement (qawl) and they largely neglect intent (qasd), pursuit (talab) and action (amal), the consequence of which is that so long as a person affirms Allaah as the sole creator, sustainer and provider, then whatever he does in his pursuits and actions will never cause him to enter into shirk. And thus, where they make mention of "worshipping Allaah alone" then it is upon the understanding that a person only commits shirk if he worships others whilst believing they have power and control over creation, life, death, benefit and harm. In other words, worship is only worship, when it is accompanied with the belief that the thing being worshipped has the qualities or attributes (ruboobiyyah) belonging only to Allaah, the Exalted. 03. He defines Tawhid, linguistically as, "to know that something is one" and this is then developed into the three aspects that define the (deficient) Tawhid of the Ash'aris and Maturidis: a) Allaah is one in His essence, accepting no division. By which they mean Allaah is not a jism (body), not composite, and this is based upon Aristotle's "immaterial, unembodied, immmutable" first cause from which the Aristotle's "Ten Categories" are denied, this comprising the bulk of their language of Tawhid. b) Allaah is one in His attributes, there being none to resemble Him. This is affirmation of the attributes without resemblance but it is not upon what has come in the Qur'an, the Sunnah and what Companions and the Salaf were upon, rather it comprises negating much of what Allaah affirmed for himself, because it entails "Jismiyyah" and "hawaadith" upon their Aristotelian conceptual baggage, and thus, the mechanisms of ta'weel and tafweed to deal with the apparent Tajseem and tashbeeh in the revealed texts. c) Allaah is one in His actions, there being no partner to Him. By which they mean the belief that only Allaah creates, provides and sustains, something that the Mushriks affirm and do not deny, and which does not enter a person into Tawhid. In reality, the Ash'arites do not actually affirm "actions" for Allaah, as in actions that are ascribed to His essence, as this would mean "hawaadith" (events) taking place in his essence, and hence to avoid this, they implement the principle (الفعل هو المفعول) to deny actions for Allaah (refer to this article on this site for an elaboration of this). The point here is that collectively, these three affairs (and in each one there are flaws), they do not constitute the Tawhid of the Messengers and this is a deficient, rather, false definition of Tawhid (even if it contains elements which are true). The Tawhid the Messengers came with is (إفراد الله بالعبادة) "to single out Allaah with (all forms) of worship" and this message is very apparent in the Qur'an, and through the disputes between the Messengers and the people to whom they were sent. 04. 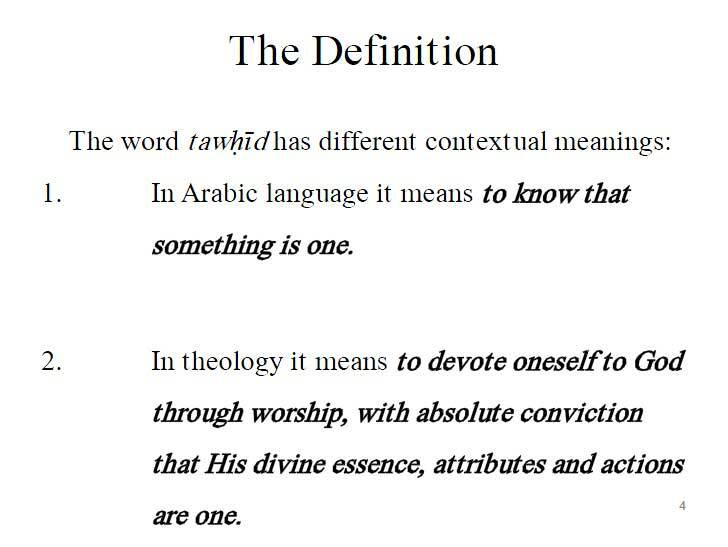 In classical dictionaries, the word Tawhid is the masdar (verbal noun) of (وَحَّد يُوَحِّدُ), which means "to ascribe oneness to something" and is (جعل الشيء واحدا), "making something one" (ascribing oneness to something) as explained in al-Fayrozabaadee's al-Qamus al-Muheet. And ascribing oneness (as it relates to Allaah) legislatively is in knowledge (ilm), belief (i'tiqaad), speech (qawl) (as it relates to Allaah) and intent (iraadah) and action (amal) (as it relates to the servant), in terms of his ibaadah (worship) of His Lord, to make that for no one and make it only for Allaah alone. In the definition of Ibrahim Osi Efa, which is the standard definition of the Ash'arites, he has restricted it to only knowledge, as in to merely affirm in belief and speech that Allaah is one in His essence, attributes and actions. Whereas the Tawhid of the Qur'an is in two matters, a) the Tawheed that relates to affirmation (ithbaat) and knowledge (ma'rifah) believed by the hearts and affirmed with the tongue and b) the Tawheed that relates to intent (qasd) and pursuit (talab), meaning, the actions (worship) of the heart and limbs being directed only to Allaah alone. Tawhid in knowledge is what is comprised in Surah al-Ikhlaas (قُلْ هُوَ اللَّهُ أَحَدٌ) and Tawhid in action in what is comprised in Surah al-Kaafiroon (لَا أَعْبُدُ مَا تَعْبُدُونَ). 05. As for the meaning of ilaah (إله), Ibn Mandhur says in Lisan al-Arab (13/467), "al-Ilaah is Allaah, the Mighty and Majestic, and everything that is taken as a deity (ma'bood) besides Him is an ilah (deity) to the one taking it as such." Al-Zajaaj says in Tafseer Asmaa Allaah al-Husnaa (p.26), "And the meaning of our saying "ilaah" (إلاه) then it is the one deserving of worship, and it is Allaah the Exalted, the one deserving of it as opposed to those besides Him." And al-Zajaaj also says in Ishtiqaaq Asmaa Allaah (p. 24), "So ilaah (إله) of the morphological form (فعال) with the meaning of (مفعول), as though it is adored (مألوه), meaning worshipped (معبود), deserving of worship, the creation worship and deify Him." And al-Jawharee says in al-Sihah (6/2223), "And aalihah (الآلهة): (they are the) idols, they are name (aalihah) because of their belief (in them) that they are deserving of worship, and the names (given to them) follow on from their belief (regarding these deities) not from (the reality) of a thing (made a deity) in and of itself" and he means here that something that is taken as an ilaah besides Allaah is an ilaah only because of the person taking it as such, not because of the reality of the matter, since there is no deity in truth, worthy of worship, except Allaah alone. However, other things are made deities when worship is directed to them besides Allaah. In the Qur'an, Allaah rebukes those who take idols, angels, jinn, men, the prophets and righteous as deities besides Allaah, directing worship to them, and they are rebuked not because they believe in ruboobiyyah for them, but because they invoke them and worship them despite affirming ruboobiyyah only for Allaah, the Exalted. And al-Fayoumi writes in Misbah al-Muneer (1/119), (فَالْإِلَهُ فِعَالٌ بِمَعْنَى مَفْعُولٍ مِثْلُ كِتَابٍ بِمَعْنَى مَكْتُوبٍ وَبِسَاطٍ بِمَعْنَى مَبْسُوطٍ), "So ilaah is (of the morphological form of) fi'aal with the meaning of maf'ool. Like (the word) kitaab (a book) with the meaning of maktoob (something written) and bisaat (rug) with the meaning of mabsoot (something spread out)." This is very clear and indicates the meaning of ilaah to be ma'looh which is ma'bood, which means that to which worship, devotion is given. 06. And this linguistic meaning of ilaah is largely the same as the legislative meaning in the Qur'an, since the meaning of ilaah is built around the meaning of ibaadah: (وَقَضَى رَبُّكَ أَلاَّ تَعْبُدُواْ إِلاَّ إِيَّاهُ), "And your Lord has decreed that you worship none but Him alone" (17:23) and (وَاعْبُدُواْ اللّهَ وَلاَ تُشْرِكُواْ بِهِ شَيْئًا), "Worship Allaah alone and do not associate any partners with Him (in worship)" (4:36) and (يَا قَوْمِ اعْبُدُواْ اللَّهَ مَا لَكُم مِّنْ إِلَـهٍ غَيْرُهُ), "O people! Worship Allaah alone, you have no other deity (worthy of worship) besides Him" (7:59,65,73,85, 11:50,61,84) and (وَلَقَدْ بَعَثْنَا فِي كُلِّ أُمَّةٍ رَّسُولاً أَنِ اعْبُدُواْ اللّهَ وَاجْتَنِبُواْ الطَّاغُوتَ), "And we sent to every nation a Messenger proclaiming, 'Worship Allaah alone and shun (the worship) of false deities'." (16:36) and (وَمَا أَرْسَلْنَا مِن قَبْلِكَ مِن رَّسُولٍ إِلَّا نُوحِي إِلَيْهِ أَنَّهُ لَا إِلَهَ إِلَّا أَنَا فَاعْبُدُونِ), "And We did not send any Messenger before you (O Muhammad) but We inspired him (saying), 'None has the right to be worshipped but I (Allah) alone, so worship Me (alone and none else)'." (21:25) and examples likes this are many which make clear the meaning of ilaah. 07. What has preceded renders false and invalidates the claim that the meaning of ilaah is (القادر على الإختراع), "one with the power to create, invent", which was ascribed to and quoted from Abu al-Hasan al-Ash'ari by his followers and is the view presented by the Ash'aris and Maturidis. And this indicates that the Mushriks of Makkah were more knowledgeable of the meaning of ilaah than these Mutakallimeen (Ahl al-Kalaam). If their claim had been correct then the meaning of (لا إله إلا الله) would be reduced to "There is no creator except Allaah" which was not disputed by the Mushriks at all or in fact by any people to whom a messenger was sent. Further, the saying of Allaah, the Exalted (أَفَرَأَيْتَ مَنِ اتَّخَذَ إِلَهَهُ هَوَاهُ), "Have you seen him who takes his own desire as his deity (ilaah)" (45:23) falsifies this claimed meaning of "ilaah" that it is "one with the power to create, invent" since no one believes his desire (hawaa) has the power to create, and there has not been in history any nation that believed in another creator alongside Allaah. 08. The disputant is then forced to acknowledge what Shaykh al-Islaam Ibn Taymiyyah rightly pointed out so many times across many of his works, by way of example, what occurs in Majmu' al-Fatawa (3/101): "And it has become clear that what they call "Tawhid", there is truth in it and there is falsehood in it, and had all of it been the truth - then the pagans, when they affirmed all of that, then it did not remove them from the shirk which the Qur'an described them with, and for which the Messenger (sallallaahu alayhi wasallam) fought them, rather, it is necessary that they acknowledge that there is none that has the right to be worshipped except Allaah alone. And the intent behind (الإله), illaah, is not (القادر على الإختراع), "one with the power to create, invent" as is presumed by whoever presumed it from the leading scholars of the Mutakallimeen, in that he thought (الإلهية), ilaahiyyah, to be having the exlcusive power over creating and that whoever affirmed that Allaah has the power over creation as opposed to others has testified that (لا إله إلا الله). For the pagans used to affirm this and alongside this they were (considered) pagans whose explanation has preceded. Rather the true ilaah is the one that deserves to be worshipped, so He is an (إله), deity, with the meaning of (مألوه), worshipped, and not (إله) with the meaning of (آله), aalih. Tawhid is that Allaah alone is worshipped without any partners with Him and Shirk (ishraak) is that another deity is set up alongside Allaah (and worshipped)." End quote. Meaning, how can you affirm all of those affairs (in the left column) and then worship, invoke others besides him of idols, prophets, angels, jinn, the righteous and so on. Indicating that mere acknowledge of Allaah being one in His essence, His attributes and His actions is not the Tawhid of the Messengers. The saying of Allaah (وَمَا يُؤْمِنُ أَكْثَرُهُمْ بِاللّهِ إِلاَّ وَهُم مُّشْرِكُونَ), "Most of them do not believe in Allaah except that they associate partners with Him (in worship)" (12:106), indicating that whilst most of mankind affirm faith in Allaah (as a creator, sustainer, provider) they associate partners with Him in worship. 10. As for the meaning of "ibaadah" al-Raghib al-Asfahani says in Mufradaat Alfaadh al-Qur'an (p. 542), "Al-Uboodiyyah (means) to manifest servitude, humility (التذلل), and "ibaadah" is more emphatic than it, because it (indicates) the extremity of servitude, humility (التذلل), and no one deserves it except the one who has the extremity of benevolence and that is Allaah, the Exalted, for this reason He said, "That you worship none but He (17:23)." And in Lisan al-Arab of Ibn Mandhur, "And the foundation of al-uboodiyyah is (الخضوع), submission, humility and (التذلل), servitude, humility." and al-Zajaaj said in Ma'aanee al-Qur'an wa I'raabihi (1/48), "And the meaning of ibaadah in the language is obedience (الطاعة) along with submission, humility (الخضوع)..." and Ibn al-Anbari said as cited in Lisan al-Arab (3/273), "So and so is an aabid (عابد), meaning he is humbling himself to His Lord, submitting to, complying with His command" and al-Fayrozabaadee said in Basaa'ir Dhawi al-Tamyeez (4/9), "And the foundation of al-uboodiyyah is (الخضوع), submission, humility and (الذل), humility." This is the linguistic meaning, however in the Shar'iyy meaning, this humility, servitude, compliance and the likes must be accompanied with love (hubb) for it to be considered worship. Ibn Katheer says in his Tafseer (1/28), "Ibaadah in the language is from (الذلة), it is said a downtrodden path, meaning lowered, humbled,and legislatively, it is an expression for that which combines perfect love (محبة), humility (خضوع) and fear (خوف)." The presence of love without compliance and obedience is not worship and the presence of obedience, servitude without love is not worship. 11. Further, the word ibaadah can be applied in a number of ways: a) when applied to all of creation, it indicates the servitude of all of the creation to Allaah, to His command, control, dominion, ownership (see Maryam 19:93), or b) the action of the servant in worshipping His Lord c) that by which worship occurs (inward and outward statements and actions) such as du'a (supplication), istighaathah (seeking rescue), mahabbah (love), rajaa' (hope) and so on and d) in relation to whom it is directed, if to Allaah, it is Tawheed and if to other than Allaah, it is Shirk, and when it is directed to other than Allaah, it is setting up rivals (أندادا) for Allaah, the very first matter prohibited in the Qur'an (2:22). And Ibn Jareer al-Tabari (d. 310H), in his exegesis (1/369) of this verse (2:22) brings narrations from the Salaf with the meanings of "men whom you obey in disobedience to Allaah", "rival gods which you set up alongside Him and to whom you give the likes of what you give to Him (of worship)" and what is similar to this and then al-Tabari comments, (فنهاهم الله تعالى أن يُشركوا به شيئًا، وأن يعبدوا غيرَه، أو يتخذوا له نِدًّا وَعِدلا في الطاعة، فقال: كما لا شريك لي في خلقكم، وفي رزقكم الذي أرزقكم وملكي إياكم، ونعمي التي أنعمتها عليكم فكذلك فأفردوا ليَ الطاعة) "So Allaah, the Exalted, prohibited them from associating anything with Him and from worshipping others besides Him and from setting up a rival, equal for Him in obedience. So He said: Just as there is no partner to Me in your creation and your sustenance by which I provide for you and My dominion over you and My favours I have bestowed upon you, then likewise, single Me out (alone) with obedience." 12. Fakhr al-Din al-Razi, a scholar for the Ash'aris (he died in 606H, almost six centuries before Shaykh Muhammad bin Abd al-Wahhaab), when explaining, "Therefore do not set up rivals (أندادا) for Allaah whilst you know" (2:22), says in his tafsir (Dar Kutub al-Ilmiyyah, Beirut, 1st edition, 2000CE, 2/103 onwards: (المسألة الأولى اعلم أنه ليس في العالم أحد يثبت لله شريكاً يساويه في الوجود والقدرة والعلم والحكمة وهذا مما لم يوجد إلى الآن لكن الثنوية يثبتون إلهين أحدهما حليم يفعل الخير والثاني سفيه يفعل الشر وأما اتخاذ معبود سوى الله تعالى ففي الذاهبين إلى ذلك كثرة), "The first issue: Know that there is on in the world anyone who affirms a partner for Allaah, on a par with Him in existence, power, knowledge, wisdom. This is something that has not been found till now except the dualists, those who believe in two gods, one of them gentle (wise), who does good and the other one foolish, that does evil. But as for taking a deity (ma'bood) besides Allaah, the Exalted, then those who enter into that are many..." He also explains a little later that no one has ever believed that what he is worshipping besides Allaah is his creator, sustainer and provider: "The knowledge (of a person) that this sculptured stone (idol) at this hour is not the one that created me and created the heavens and the earth is necessary knowledge. Thus it is impossible for a large multitude to come to agreement over [such a false religion]. Hence, it is necessary that the worshippers of idols have some other objective besides that. And the Scholars have mentioned a number of angles in this regard..." Then he explains six reasons why people worship others besides Allaah (without affirming ruboobiyyah for them) and five of them are: (1) those who worship Angels thinking they will bring them closer to Allaah (2) those who worship the stars thinking they affect events on Earth (3) those who took talismans at specified times thinking them to have influence (5) those who believe Allaah indwells in their statues and thus worshipped them (6) those who, over the passing of time, took places where worship took place, such as mihrabs and the likes, as things to be worshipped, out of veneration of them. And as for the remaining one (the fourth), he says about it, "And the fourth of them, that when a senior man died amongst them, and they believed that his supplication is answered and his intercession is accepted with Allaah, the Exalted, they took an idol in his form, and worshipped it upon the belief that that man will be an intercessor for them with Allaah on the Day of Judgement, upon what Allaah, the Exalted, has informed abuot them in this statement in His saying, "[They say], these are our intercessors with Allaah" (10:18)." Whilst noting that they are not worshipping the idol, as they do not believe it will benefit them, but they took it as a focal point in order to direct worship to the righteous dead, that is their real intent, as al-Razi makes clear a little earlier and elsewhere. In another place in his tafsir (17/63), when discussing the saying of Allaah (about the pagans), "these are our intercessors with Allaah" (10:18): "And the fourth of them: That they made these idols and statues upon the form and shape of their Prophets and senior [righteous] ones (al-akaabir), and they claimed that when they occupied themselves with the worship of these statues, then those senior [righteous] ones (al-akaabir) will be intercessors for them with Allaah. And the equivalent of this in our time is the occupation of many of the creation with the veneration of the graves of the senior [righteous] ones, upon the belief that when they venerate their graves, then they (the deceased) will become intercessors for them with Allaah." From all of this we understand the nature of the shirk which appeared was that people began to flock to the tombs and graves of the righteous dead, and they began to dedicate worship (invocation) and the likes, and their intent was not the tombs and graves in and of themselves, but those whom they represent, the righteous dead, to seek their intercession. Because the righteous dead are out of sight, then whatever is in sight (tombs and graves) becomes an alternative representation, a replacement, and thus worship that is intended to those righteous dead is channelled through what is taken as a visual representation or replacement - and this is the reality of the shirk of those who worship idols. No one ever believed in ruboobiyyah for his idol, but the idol was a focal point for worship intended for the one represented by the idol. However, just because this is a particular manifestation of shirk, it does not mean that an idol (statues and their likes) has to be involved for something to be shirk. Since, the definition of shirk is much broader as evidenced in the Qur'an, it is simply to direct worship (in its forms and types) that is due to Allaah alone, to others besides Him and believing in the ruboobiyyah of those others is not a condition for it to be shirk. 13. All of the above indicates that no nation in history has claimed two creators, or a partner for Allaah in creating, and even the dualists mentioned by al-Razi, they believe the god of light is the good god, who created everything, even if they claim that the god of darkness, is responsible for evil. So when no nation has believed in a creator besides Allaah, then the dispute with all nations who departed from the teachings of the Books and Messengers was in relation to directing worship to other than Allaah, alongside them believing that only Allaah creates, provide and sustains - and thus we see the argument of the Qur'an against them, as has preceded, that if you affirm all of this (the various aspects of ruboobiyyah only for Allaah), what has made you invoke others and worship others for aid, assistance, intercession and so on, be they idols, angels, jinn, prophets , the righteous? 14. Contrasting what has preceded to the understanding of Tawhid and ibaadah with the Ahl al-Kalaam, then they claim that ibaadah is only such when it is coupled with the belief in something that it has uloohiyyah and ruboobiyyah. In other words, something is only "worshipped" when the act of worship is founded upon belief that that thing has ruboobiyyah (has control over creation, sustenance) and they also treat uloohiyyah to be synonymous with ruboobiyyah. This is the generality of what is found with the Ash'arites and this can be exemplified through a few citations from Ahmad Zaynee Dahlaan who says in his Durar al-Sanniyah (p. 24), when defining du'aa (supplication), "The invocation which becomes ibaadah (worship) is the invocation of the one who believes in His uloohiyyah and His right to worship, and thus they aspire to Him and humble themselves in front of him (with du'a)" - and what he has done here is to tie and restrict worship with the presence of belief, which means that shirk can only take place in the presence of the belief that the entity worshipped besides Allaah has control over life, death, benefit and harm. This is made more clear in Dahlan's statement (p.34), "That which causes one to fall into shirk (ishraak) is the belief in the uloohiyyah of other than Allaah, the Sublime, or the belief in (someone) besides Allaah having effect (ta'theer) [over things]." And on the same page he also says, "For Tawhid al-Ruboobiyyah is Tawhid al-Uloohiyyah" - and this is false and clashes directly with the Qur'an and what all the Messengers brought. For the whole argument of the Qur'an against the Mushriks is that if you affirm Allaah's ruboobiyyah how then do you associate partners with Him in His uloohiyyah, and Allaah the Exalted said (وَمَا يُؤْمِنُ أَكْثَرُهُمْ بِاللّهِ إِلاَّ وَهُم مُّشْرِكُونَ), "Most of them do not believe in Allaah except that they associate partners with Him (in worship)" (12:106). Dahlan also says (p. 34), "No one from the Muslims believes in the uloohiyyah of other than Allaah, and nor anyone having any (controlling effect) except Allaah, the Exalted" This means that if any Muslim falls into any of those actions of shirk that resemble the actions of shirk of the people of Jaahiliyyah, this is not considered shirk for him because he did not accompany it with the belief that anyone besides Allaah creates, or has power and control over life, death, benefit and harm. This false understanding of Tawhid and Ibaadah is found in the writings of all contemporary Ash'aris and Maturidis. 15. Upon all of this, the definitions laid down here by Ibrahim Osi Efa are deficient, false definitions of terms whose realities are clear in the language and in the Qur'an, and these grave and serious errors regarding these definitions from the very outset will lead a person down a path whereby he thinks that he can invoke others besides Allaah, seek rescue from them, seek refuge in them, ask them for benefit and repelling of harm and so on and so long as he does not believe that they have control over life, death, benefit and harm, he has not opposed what the Messengers called to. And so long as he believes only Allaah has control and power over things and believes Allaah is to be worshipped, then he is free to supplicate to the dead, seek rescue from them and solicit them for benefit and repelling of harm and intercession and the likes and because he does not believe they have power over life and death, benefit and harm, he is not "worshipping" them. This clashes directly with what we find in the Qur'an and it shows great deviation from what is very clear and apparent in the Qur'an without ambiguity. Allaah created mankind upon the fitrah (innate recognition of the existence of a creator and His right to be worshipped), so recognition of the creator is fitriyy, dhurooriyy and does not require reason for it to be established. However, in order to establish the hujjah, Allaah made reward and punishment based upon revealing Books and sending Messengers, and did not make it upon the fitrah (or reason) alone. So the Messengers, when they came, they appealed to the fitrah of the people, ordering them to worship Allaah alone, and where there was corruption in fitrah, an appeal to reason (aql) was made (that reason being indicated in the revealed texts itself). As for proving Allaah's existence, then this was never disputed by any nation (except very rarely), and hence, this is hardly addressed in the revealed Books. Therefore, the Tawhid of the Messengers, is to single out Allaah in Uloohiyyah (right to be worshipped) (upon its correct meaning) and upon what is already established in the fitrah that there is no deity worthy of worship besides Allaah. Thus, acknowledgement of a creator, owner, provider (which is fitriyy, dhurooriyy), leads necessarily to directing worship only to Him alone, and the Messengers were sent to complete and perfect the fitrah. Hence, the Qur'an affirms Allaah's ruboobiyyah, affirms His names and attributes through which the hearts know, love and yearn for Him and calls for worship (in all its forms and types) to be directed only to Him alone and not to others. Upon the false premise that a person must prove the universe is originated and has a creator through the use of pure reason, the Mutakallimoon entered into the bid'ah of Kalaam, the use of foreign philosophical conceptual baggage to devise a proof that allegedly proves Allaah's existence, but which in turn (for it to be valid) requires Tawhid to be characterized through the same conceptual baggage and hence, the deity of the Ahl al-Kalaam resembles the diety characterized in the language of Aristotelian Metaphysics, (not a jism, not a jawhar, not an arad, not in makaan, not in a jihah, not in zamaan...). When they made this to be the foundation of Tawhid (to remove Aristotle's Ten Categories from the originator identified in their Kalaam argument), they erred in defining the reality of what the Messenger's came with and neglected the actual Tawhid the Messengers came with, which is to single out Allaah with all forms and types of worship. Hence, their Tawhid revolves around Allaah's Ruboobiyyah, meaning to affirm He exists, to prove it rationally, and to believe only He creates, provides and sustains, and so long as this belief is held only for Allaah, then one may invoke, seek rescue and aid from those besides Allaah without that constituting worship, as it would only become worship if it is believed at the same time that others besides Allaah have ruboobiyyah, that they the power and control over life, death, benefit and harm alongside Allaah - yet even the Mushriks mentioned in the Qur'an did not affirm this for other than Allaah. 17. Thus, the reader should be aware as to exactly what Ibrahim Osi Efa means when he defines Tawhid as "to devote oneself to God through worship, with absolute conviction that His divine essence, attributes and actions are one", how do they define worship (ibaadah) and what is their Tawhid? He does not mean the Tawhid of the Messengers, but he means the Tawhid of those who opposed the Messengers by making something obligatory upon the mukallafeen (legally responsible after reaching maturity) which is already established in the fitrah to begin with, and making that the foundation of the religion (proving the existence of a creator), and then defining Allaah through Aristotelian conceptual baggage, and this forms the greater part of their Tawhid whilst neglecting the actual Tawhid that the Messengers were sent with. This definition given by Ibrahim Osi Efa should now be clear. You have to understand what is meant by "worship" in his definition and the qualification he adds to it, "with absolute conviction that His divine essence, attributes and actions are one." Keeping in mind the sample statements from Ahmad Dahlaan a little ealier, essentially, it means that if you were to invoke a rock from a thousand miles away asking for relief from hardship, but without believing it is a creator alongside Allaah, and without believing it has power over life, death, benefit and harm, then you have not committed shirk. Likewise, if you invoked an angel, or a jinn for the same. Likewise, if you invoked, "Yaa Alee madad" (O Alee, help, come to my rescue), but you do not believe Alee (radiallaahu anhu) has ruboobiyyah, rather you believe only Allaah has ruboobiyyah, you have not committed shirk. And the same with invoking the saints and righteous dead. This is the shirk understood by these people and as you can see from what has preceded, the Mushriks of Makkah were more knowledgeable of their own shirk and the Tawhid they denied, and they recognized the Qur'anic argument against them, which is that though you call only upon Allaah in times of dire need and calamity, knowing only He can help you in that situation, when you reach the shores safely, you invoke others besides Him, whilst acknowledging still that only He has ruboobiyyah, control over life, death, benefit and harm. Allaah, the Exalted says, (فَإِذَا رَكِبُوا فِي الْفُلْكِ دَعَوُا اللَّهَ مُخْلِصِينَ لَهُ الدِّينَ فَلَمَّا نَجَّاهُمْ إِلَى الْبَرِّ إِذَا هُمْ يُشْرِكُونَ), "And when they embark on a ship, they invoke Allaah (alone), making their deen (worship, devotion) purely for Him only, but when He brings them safely to land, behold, they give a share of their worship to others" (29:65). 18. In the next slide Ibrahim Osi Efa states that the term "Tawhid" when synonymous with the science of theology refers to a "science that enables a person to affirm religious creed on the basis of absolute proofs." We shall contend with this in the next part in this series inshaa'Allaah and explain what the Ahl al-Kalaam mean by this and show that what they claim to be absolute proofs are mere mirages that do not prove what they assert to prove, namely a creator, prophethood and resurrection, and they sought to prove these things by abandoning the method of the Qur'an and using what they claim is "reason" when it in fact opposes both reason and revelation together.